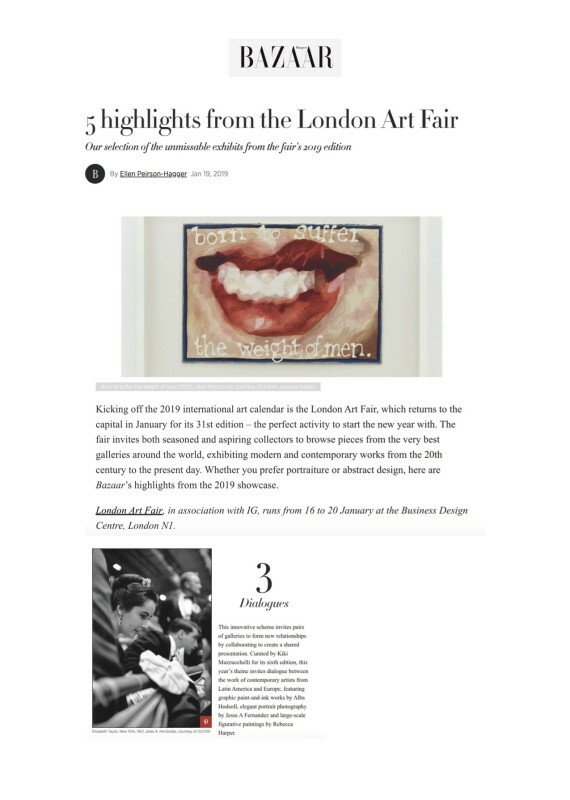 Kicking off the 2019 international art calendar is the London Art Fair, which returns to the capital in January for its 31st edition – the perfect activity to start the new year with. The fair invites both seasoned and aspiring collectors to browse pieces from the very best galleries around the world, exhibiting modern and contemporary works from the 20th century to the present day. Whether you prefer portraiture or abstract design, here are Bazaar’s highlights from the 2019 showcase. London Art Fair, in association with IG, runs from 16 to 20 January at the Business Design Centre, London N1. Exhibiting work from some of the world’s most renowned living artists, the fair will feature pieces by David Hockney, Banksy and Grayson Perry. Further highlights include Hazelton Fine Art Galleries, which will bring a selection of Salvador Dalì bronze sculptures to mark the 30th anniversary of the artist’s death, and the strong focus on prints, including exclusive releases by David Shrigley and Charming Baker, and, elsewhere, abstract works by Freya Payne, Dominic Beattie and Michael Roberts. Art Projects has returned to the Fair every year since 2005, supporting emerging galleries by showcasing the newest contemporary art from around the world. Highlights from the 15th edition include a new body of work by the London and Beijing-based painter Xiao-yang Li in which she creates ceramic sculptures that echo subjects found in her paintings, investigating the relationship between space and surface. ARTCO Gallery will stage a group exhibition addressing the theme of national and cultural identity, including the work of the Burkina Faso-born Saïdou Dicko, who works across photography, video, installation and painting to create evocative scenes about everyday life. This innovative scheme invites pairs of galleries to form new relationships by collaborating to create a shared presentation. Curated by Kiki Mazzucchelli for its sixth edition, this year’s theme invites dialogue between the work of contemporary artists from Latin America and Europe, featuring graphic paint-and-ink works by Alba Hodsoll, elegant portrait photography by Jesse A Fernandez and large-scale figurative paintings by Rebecca Harper. For the past 12 years the fair’s annual guest-curated exhibition has provided a critical forum for examining some of the most distinctive elements of current photographic practice. This year Photo50 will engage with fundamental questions about the changing dynamics of family life. Who’s looking at the family now?, curated by Tim Clark, will exhibit the work of 14 British and Irish artists such as David Moore and Trish Morrissey, alongside artists showing in London for the very first time, including Alba Zari, Amak Mahmoodian and Mariela Sancari. Founded in 1923 with a bequest of 22 paintings by Alderman John Chisolm Towner, Eastbourne’s Towner Art Gallery partners with the fair to present The Living Collection. The selection of 27 works reflects the gallery’s evolving collection of contemporary art gathered over almost a century, including pieces by Eric Ravilious, Gertrude Hermes and Wolfgang Tillmans, and will shed a light on the heritage of Eastbourne and East Sussex, a place that has nurtured and inspired artists throughout the twentieth century.